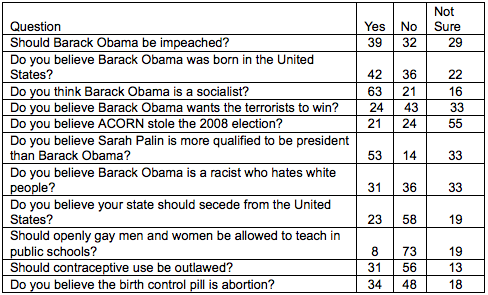 Research 2000, a polling firm, surveyed self-identified Republicans and found some sad (I almost wrote “shocking”) results. This party is really going off the rails. I mean, 64% of those polled can only say “not sure” about or think our President “hates white people.” 57% are not sure about or agree with the statement that he “WANTS THE TERRORISTS TO WIN!” Where do these views come from? The Republican party leadership has a lot of responsibility to help tame the more rabid elements of this increasingly reactionary party. I'm kind of blown away by some of these answers. I mean, I can understand some of these opinions being thrown out as talking points, but to actually believe Obama HATES white people? Why? How? What on Earth leads a person to come to such a conclusion?